In Release 12, the Accounting Setup Manager is a new feature that centralizes the setup And maintenance of common financial components within an accounting setup. An Accounting setup defines the accounting context for one or more legal entities or other Business entities. The upgrade creates a separate accounting setup for each primary ledger that is Upgraded from a set of books. The status of the accounting setup will be completed. Each accounting setup is a grouping of accounting-related setup components. 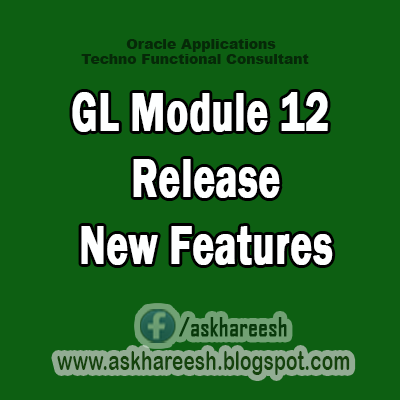 Legal Entities: HR Organizations classified as GRE/ LE in Release 11i will be Preserved as Legal Entities in Release 12. Legal entities can be manually assigned to A ledger and balancing segment values can optionally be mapped to legal entities to Help you identify transactions by legal entity during transaction and journal Processing. For more information about the upgrade for legal entities, see the Legal Entity Configuration section. One Primary Ledger: Most sets of books in Release 11i will become primary ledgers In Release 12. The details for the set-of-books upgrade are discussed in the Set of Books section. Operating Units: All HR Organizations classified as operating units will be Preserved in Release 12. If operating units are assigned to a set of books, then they Will be associated to a primary ledger in an accounting setup. You can now view all Operating units assigned to an upgraded primary ledger using Accounting Setup Manager. Reporting Currencies: Multiple Reporting Currency (MRC) reporting sets of books Become reporting currencies in Release 12. The Multiple Reporting Currency Upgrade is discussed in the Multiple Reporting Currency Changes section. Secondary Ledgers: Multiple-Posting set of books (Global Accounting Engine) will Upgrade to secondary ledgers. The Global Accounting Engine upgrade is discussed In the section on Global Accounting Engine Integration. Intra-company Balancing: Inter-company Accounts in Release 11i is renamed to Intra-company Balancing Rules, a feature provided by the new Advanced Global Inter-Company System. Subsidiaries, Inter-company Transaction Types, Inter-company Clearing Accounts, And Auto Accounting Rules.